These compatible Brother TN350 black toner cartridges from InkTonerWeb.com are guaranteed to perform with your Brother DCP-7020, HL-2030, HL-2040, HL-2070N, IntelliFax 2820, IntelliFax 2910, IntelliFax 2920, MFC-7220, MFC-7225N, MFC-7420, MFC-7820N laser printers. 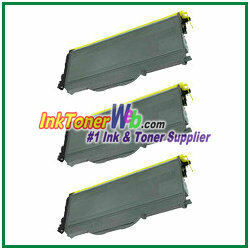 They replace the original Brother TN-350 / TN350 toner cartridges. Our compatible (generic) replacement TN350 toner cartridges are made in ISO9001 & 14001 factories and meet the highest standards of quality, reliability and exceptional yields, offering high-quality printing results as OEM TN350 toner cartridges.